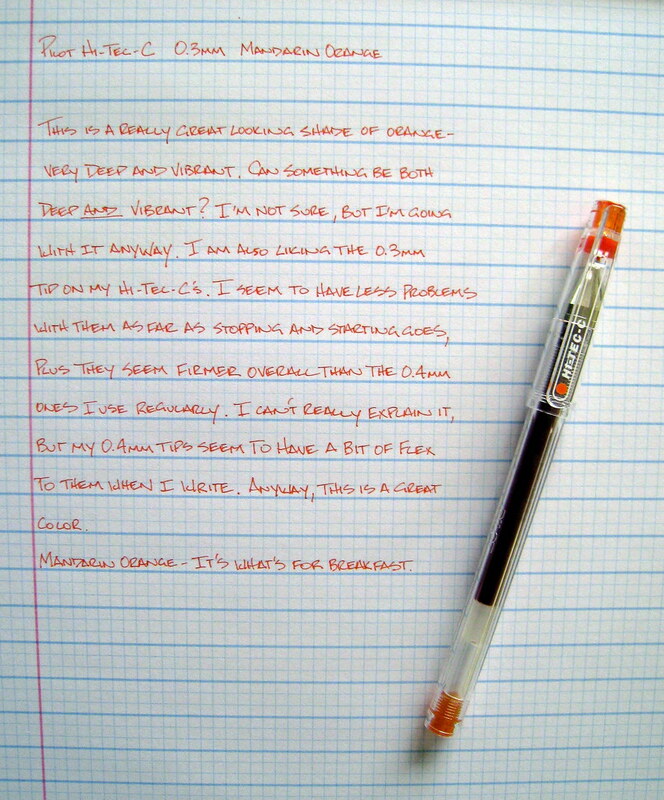 The shade of orange this Pilot Hi-Tec-C Mandarin Orange lays down is awesome! It is a very strong and sharp color, which I am getting a lot of use out of. And it looks like the 0.3mm Hi-Tec-C's are my sweet spot - the perfect combination of line thickness and performance. I did this review on Doane Paper, as opposed to the Moleskine Reporter notebook paper, which most of my past reviews are done on. The Doane Paper is much smoother, and I have more room to do a few different things with the reviews. I need to work on the lighting in my photographs a bit, but otherwise, I like it a lot, and I am thinking about doing the majority of my reviews on Doane Paper going forward. What do you other pen addicts think about the possible new format? Posted on September 17, 2008 by Brad Dowdy.